The Minato Bridge is a Gerber truss structure that spans between Sakishima Island and the Port of Osaka in Osaka Bay. The center span was brought to the site on a barge and lifted into place with winches attached to the cantilevered ends. It is a double-deck bridge with side spans of 235 m and a center span of 510 m. The bridge is part of the Wangan Expressway and is just south of the Tempozan Bridge. It was built in 1974 for the Hanshin Expressway Public Corporation (HEPC) at a cost of 25 billion yen. 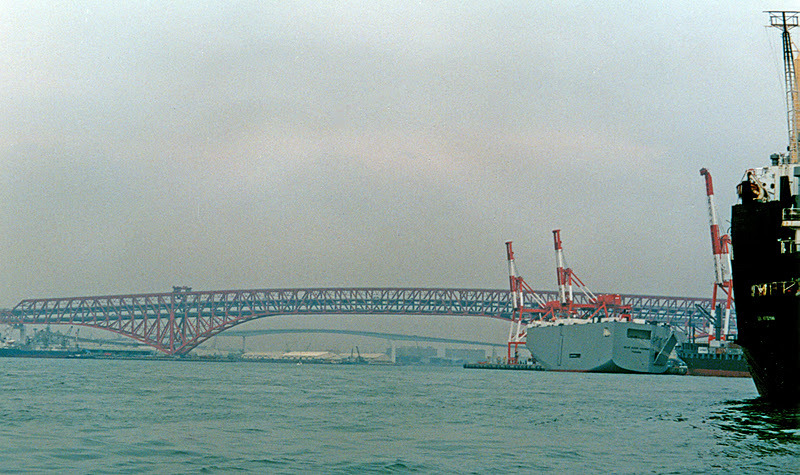 Osaka Bay Bridges: Minato Bridge by Mark Yashinsky is licensed under a Creative Commons Attribution-NonCommercial-ShareAlike 3.0 United States License.